Worked first time, trouble free results. You can feel the difference. Everything you need is in the package. Including a few extras. Would recomend to anyone who uses a A5. It was like a whole new marker. You didn't warn me about that. Now I can't stop smiling . A night and day difference. Simple to install . Thank you engineers !! Keep up the great work! This is the best upgrade I've done to my tippmann 98! Shoots faster and conserves more air. Customer service is AMAZING also!! If you want your gun to shoot quieter faster and smoother , look no further! It's like a whole different marker! Thanks! 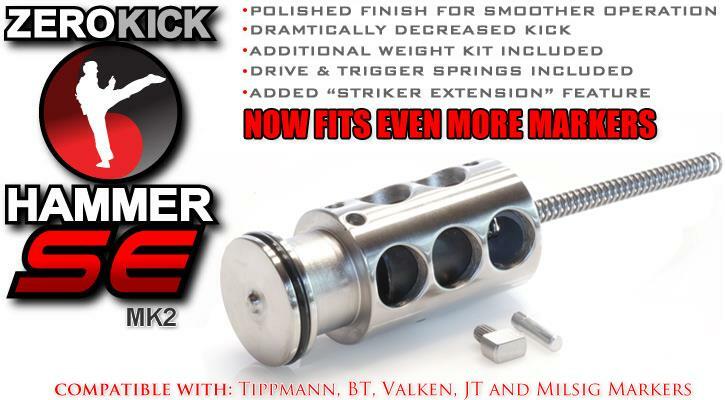 Like this hammer it makes my tippmann 98 faster, it is a good hammer !!! So if you want a good hammer the zero kick hammer se is the one! This is one of the best upgrades for the A-5 hands down! It's lighter, faster and has less recoil. My A-5 is more consistent (no more balls curving at the end) which makes me more acurate. Buy it you won't regret it! JUST BUY IT!!!!!! Take my word for it. You will NOT be let down. AMAZING!!!! !